After 9/11, it's understandable that the aviation industry wanted to make the cockpit unbreachable by fortifying the door. In light of the Germanwings crash, which officials claim was caused by co-pilot Andreas Lubitz deliberately downing the plane, it's clear that unbreachable does not necessarily mean safe. Had there been different safety measures and protocols in place on that Germanwings flight, the other pilot or a crew member could have been able to access the cockpit and stop the pilot from crashing the aircraft. 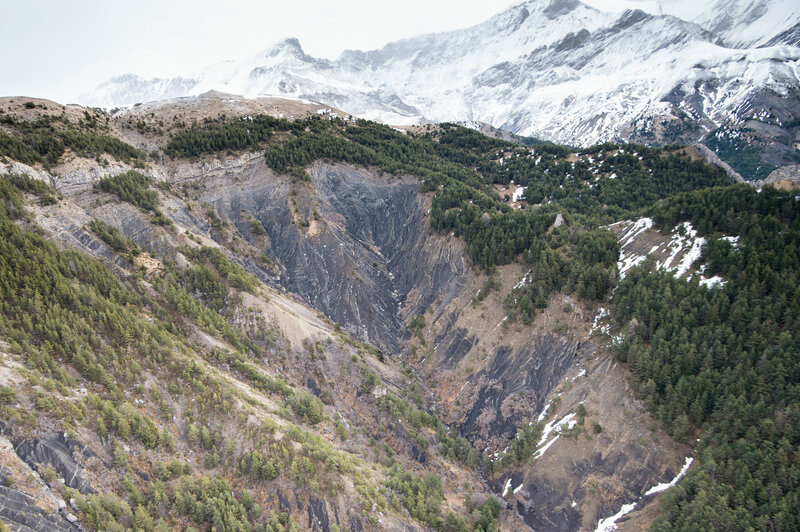 So what other measures could prevent another Germanwings tragedy? A bit of background: On Wednesday, officials stated at a press conference that co-pilot Andreas Lubitz deliberately crashed the plane after locking the other pilot out of the cockpit. Because of certain security measures that were put in place after 9/11, it was impossible for the locked-out pilot to reenter the cockpit and thwart Lubitz's plan. Peter Goelz, former managing director of the U.S.'s National Transportation Safety Board, told CNN that the 9/11 hijackings prompted the the U.S. Federal Aviation Administration and aviation industry to tighten cockpit security, primarily focusing on strengthening the door and implementing "procedures that the pilots take to fly the airplane in a different way if hijackings are attempted." What the FAA didn't account for, however, was the possibility that a pilot would hijack the plane. Though it's unlikely the aviation industry will establish a protocol for this specific, exceptionally rare scenario, there are a few possible measures that could be implemented to prevent another similar incident from happening in the future. Unlike U.S. aviation regulations, European regulations do not require airlines to have two people in the cockpit at all times. At a press conference on Thursday, Lufthansa chief executive Carsten Spohr, said that Lufthansa, and therefore Germanwings, does not have such a protocol, and he wasn't aware of any competitors having the policy. The policy of having two people in the cockpit at all times makes a lot of sense, though. If something happened to the pilot and he was the only one in the cockpit, enough time could pass to endanger the aircraft before the other pilot returned. Or, in this case — though it's rare, it can clearly happen — if one pilot has nefarious intentions, another person in the cockpit could help thwart his plans. This may seem like a superfluous measure, but after Germanwings, no one's going to question the need to consider every possible scenario — and that includes abusing the override button. There should probably be a countermeasure against this, like a second code that not only overrides the override button, but also gets into the cockpit. In order to reduce the chances of abusing this code, it could be assigned to a crew member by random before each flight. Goelz told CNN that this idea had actually been entertained by aviation security groups. They talked extensively about whether we should give a random member of the flight crew ... an ability to enter the cockpit. But then they decided that that was, just from a security standpoint, you couldn't guarantee that outsiders wouldn't learn that. This is a long shot, but this could potentially prevent all kinds of air disasters, not just deliberate ones. If airplanes could somehow be controlled from the ground, specifically from air traffic control, it would be yet another safeguard measure to override what's happening on board. According to the Economist, because most modern aircraft are now fly-by-wire (using an electronic interface rather than manual controls), it's possible for terrorists to hack the system and tamper with the flight remotely. Although that's a terrifying notion, that also means that it's possible for air traffic control or another remote mission control hub to control aspects of the flight should something happen on board. Commands might be limited, but even just the ability to level out an airplane losing altitude could help prevent a disaster.